Happy Tuesday everyone! I wore this look over the weekend to celebrate Drew’s 29th birthday. I love to dress up on weekend nights, especially ones where we’re celebrating something special, like a birthday, but I also don’t like to be too overdressed. To avoid this, one of my favorite ways to style a look is to juxtapose pieces, pair casual items with dressy items. An embellished top, tailored blazer and /or heels paired with distressed denim jeans, like this ensemble, strike the perfect balance between laid back and dressed up. How do you give your dressy pieces a more laid back vibe? This outfit is beautiful as always! I do the same thing when I want to dress up but not too much. I also combine a dress and add a fitted denim jacket to bring the dress to a more casual vibe. Who takes your pictures?? And what kind of equipment do you use? They are always beautiful, aside from the fact that you are beautiful too! Stunning look Rach. I love doing the same thing with my outfits on the weekend. Love the feminine details mixed with the distressed denim! Love those jeans! Perfect distressing. 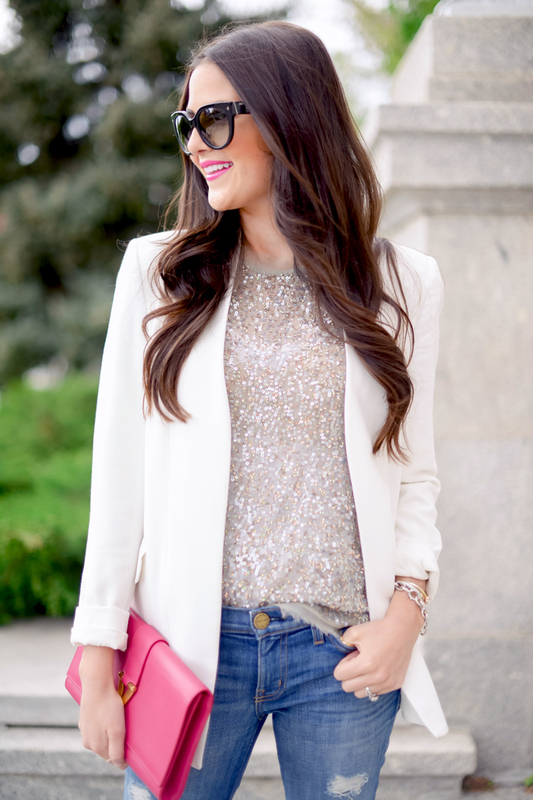 Love the layer of sparkle to the blazer! Yes, yes, and yes! I absolutely love that blazer! I have a similar one from Alice and Olivia that I wear all the time. So chic! Lovely! The pops of glitter is so darn sweet! Beautiful outfit! You look so chic, perfect top and pumps! This look is beyond perfect on you Rach! I can’t get enough of tailored white blazers and silver heels this year (not to mention distressed jeans). Can’t wait to try out a similar look for my 2 year anniversary dinner. I love the blazer with the destroyed skinnies. Very cute! So chic as always! Hope you had a fabulous time celebrating your husband’s birthday! I love the Saint Laurent clutch! Rachel I love this look. The sequins are just perfect, and the blazer being white makes it still feel like a summer outfit. I am definitely a fan:) My go to for a dressy laid back look is adding that dressy feel with amazing accessories. Sometimes an outfit just needs a little sparkle. Like you did with this super cute top!!! Love it. Hope you have a great day!!!! Loving the sparkly top!!!!! Great outfit. Gorgeous look and Happy Birthday to your husband! I love mixing sparkle with denim and the YSL Chyc clutch gives the look the perfect pop of color. I just love that iconic “Y”… I wear my tote all the time. Will have to check out these jeans! They look like they are perfectly distressed. Love how you styled the sparkly tee! So gorgeous! Loving this dressy top paired with the distressed denim! love this dressed up and down look! the jeans are perfect and i definitely need a white blazer and metallic heel! I love this outfit – distressed jeans are my favorite way to offset dressier pieces, too! those look like the Everly pumps, is that correct? Not the Valentinas? loving how dressy and how casual this outfit is! that blazer looks so versatile. and how do you get your hair so flawless?? I love your outfit! Perfect for spring. Love the mix of casual and dressy. That top is so beautiful! Great look and happy birthday to your hubby. Love the hints of sparkly-ness! So sweet! Can I ask what your lip color is? I love the cheery pink! Lovely outfit. Perfect to celebrate a special birthday! Obsessed with your heels. I feel like they could go with so many different outfits. You are the absolute cutest!!! We love following your blog and are probably your #1 fans! We’d love it if you checked out our blog, we are just starting out. You are the absolute cutest!!! Would love it if you checked out our blog, we are just starting. I love this outfit! It has the perfect balance of glam and casual – and I”m obsessed with the top! Your hair color too!! which one is it please?!! You’re always so effortlessly stylish. I recently bought a tailored white blazer and will definitely be putting my own twist on this look, so thanks for the inspiration! Love this look! So cute! Gorgeous look! So timeless and chic! Such a cute outfit. Love the blazer. That embellished top is great. Perfect as always. I am so in love with this! I’m going to try this out tomorrow and hopefully it looks as good on me as it does on you!! This glitter top is so amazing. I have been looking for a white blazer like this one too. Love the sparkle top! Super cute! The juxtaposition of casual and dressy clothes is my absolute favorite way to style! I am loving this look! Your skinny distressed jeans are perfect!! The white blazer is so chic!! Always gorgeous. That’s my style as well – casual glam. Happy bday, Drew! You look beautiful!! I love this outfit!! Love a nice white blazer and this one looks so well constructed! Great look! This is a lovely combination! Right up my alley. The pop of pink is perfect! This is a great look to dress up but still look laid back. Very cute! And happy birthday to your hubby! Great style. love the jeans with these glittery top. Gorgeous look! This is definitely something I would wear. Happy birthday to your sweetheart! Love this outfit so much! The metallic pumps with that top are perfect. Hi Rachael! Just curious to know who designed your blog?? I absolutely LOVE how you wore this embellished shirt!! I love ANY and EVERYthing embellished!! Great look! I absolutely love that blazer! Very beautiful outfit. Also perfect photos.